With the wave equation, the underlying theory was well established. 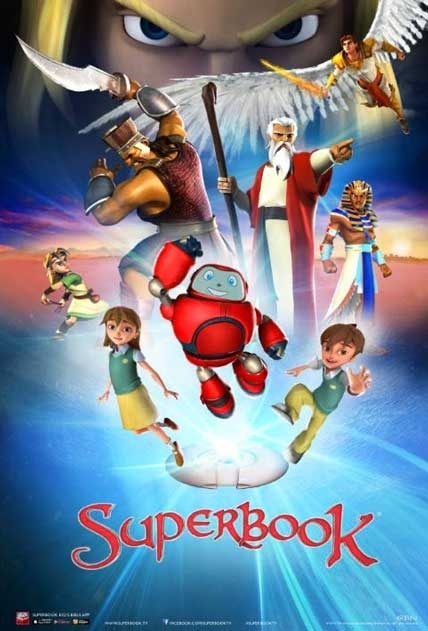 But because a) the problem is non-linear and b) solved using a computer routine, putting the method into practice involved developing a computer code which was reasonably simple to use and gave consistent results. Distributing that code, simple today with personal computers and now “cloud” computing, was a “mainframe to mainframe” proposition at the time. Beyond this, the code had to correspond to actual performance in the field, and that required a fairly extensive research program. Although there were efforts in that direction during the early 1960’s, the first really extensive development of the wave equation after Smith was done by the Texas Transportation Institute (“TTI”) at Texas A&M University. The effort was fist funded by the Bridge Department of the Texas Highway Department and later the Bureau of Public Roads, developed the “TTI family” of wave equation programs. This effort continued throughout most of the 1960’s. In the course of research many of the fundamental questions surrounding the technique were investigated, including cushion material properties and pile-soil interaction. Subsequent to that effort the technique was applied to the offshore platform construction industry, whose long piles and demanding environment made wave propagation analysis an absolute necessity. A diagram showing the relationship of the physical and modelling components of the wave equation, featuring a Vulcan hammer in offshore leaders. From Offshore Technology Conference paper 1055, presented at the first OTC in 1969. Until the 1980’s the TTI program was the dominant wave equation program used (in the U.S. at least,) when it was overtaken by the WEAP program. The original, mainframe implementation, described in some of the papers below. TAMFOR, a version adapted to a time-share program at the Waterways Experiment Station. I am indebted to Dr. Lee L. Lowery <>< at Texas A&M University, who was involved in the original research, for furnishing the computer program and the papers available on this page. Dr. Lee L. Lowery, Jr., P.E. MICROWAVE is the latest direct version of the TTI Wave Equation Program. It was developed at Texas A&M University and is considered by some to be the definitive version of the wave equation for piles. 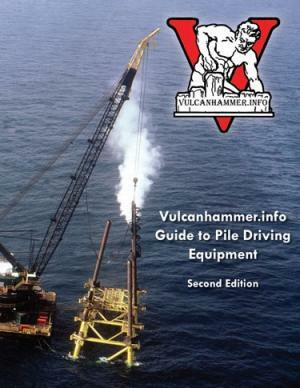 vulcanhammer.info presents it courtesy of Dr. Lee L. Lowery, Jr., of Texas A & M.
Also available is the documentation for the program, which is also an excellent reference on the wave equation in general. You will need Adobe Acrobat to view this documentation. Create a directory for MICROWAVE. Download the ZIP file into the directory you have created by clicking on the program name below. Using an appropriate program (such as PKZIP or WinZip,) extract the files into the same directory. Permission granted to copy both software and user’s manuals so long as original author credits remain. Based on the information gathered during a design pile testing program, and the subsequent construction of a large pile foundation in Quebec City, the potential and limitation of the wave equation analysis for analysing pile driving behaviour are demonstrated. The application of the wave equation method to instrumented precast concrete piles driven under well controlled conditions leads to excellent predictions both in terms of driving stresses and of ultimate bearing capacities. The same high quality of prediction is obtained for a steel H-pile and a precast concrete pile driven incrementally to a depth of 53 ft. (16.2 m) in a uniform sand deposit. However, proper simulation of the joints is required for the precast concrete piles. On the contrary, a very poor correlation between computed and observed ultimate capacities is obtained for the production piles. This is attributed to the poor reliability of the blow counts used as input data in the classical wave equation method of analysis. The use of the wave equation to investigate the dynamic behaviour of piling during driving has become more and more popular during the past several years. Widespread interest in the method had its beginning in 1960 when E. A. L. Smith used a numerical solution to investigate the effects of such factors as ram weight, ram velocity, cushion and pile properties, and the dynamic behaviour of soil during driving. Since then, vast quantities of data have been amassed in experimentation to determine more accurate values for the input variables required, and a multitude of full-scale pile tests have been correlated with the wave equation. These correlation studies have proven that the wave equation is more accurate than other methods and can be used with reasonable confidence. Because of this, the method is becoming widely used and recommended in the literature by foundation experts. However, as noted by Chellis, a wave equation analysis required the use of a high speed digital computer; before an engineer could utilize the method, he had to develop a relatively complex computer program which was both time consuming and expensive. Therefore, even though the wave equation might be far more accurate, the simplicity of the dynamic pile driving formulas made their use attractive, especially for field use. For this reason, Chellis and others suggested that the wave equation should be used to determine if there might exist ranges of application through which simplified dynamic formulas were reasonably accurate. He suggested that, “if it can be determined that the Hiley or Engineering News Formula results are safe and that ultimate driving resistances are in reasonable agreement with wave equation results in any general range of conditions, then such formulas might permissibly be used within such limits. This might enable such simple formulas to be quickly applied in the office or field, thus avoiding the necessity of access to a computer in order to be sure of obtaining sufficiently reliable and economic results.” This report presents the results of such a study, and demonstrates that it is indeed possible to find ranges of agreement between the wave equation and certain pile driving formulas. Charles H. Samson, Jr., Teddy J. Hirsch, and Lee L. Lowery, Jr.
Journal of the Structural Division, Proceedings of the American Society of Civil Engineers, Vol. 89, No. ST4, August, 1963. The application of wave theory to the investigation of structural behaviour of piling is examined. A digital-computer program based substantially on the work of Smith was used in generating the theoretical solution. The essentials of Smith’s development are given, followed by an investigation of certain extensions and applications of the procedure. 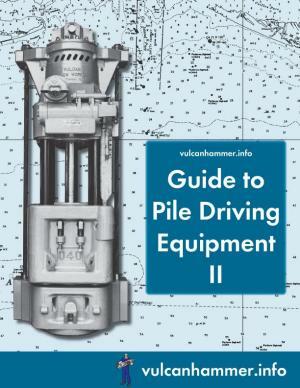 It is illustrated how, through the use of high-speed digital computation, the influence on pile behaviour of factors such as ram weight, ram velocity, diesel-hammer pressure, cap block and cushion-block stiffnesses, pile material properties, and soil properties may be evaluated. Comparisons are made with the “exact” solution for an ideal bar and with experimental results from a field test. The effects of segment length and time interval for the discrete-element solution are examined. The use of the automatic plotting capability of the digital computer is illustrated. The one dimensional wave equation method of pile analysis has proven to be a powerful tool which can be used for the design of the piles, selection of hammers and other accessories for installation, and for evaluation of the load capacity of the piling as they are driven in hostile environments. The wave equation can be used along with foundation exploration and evaluation techniques to select the pile size and thickness which could be expeditiously driven to the desired penetration (or capacity) without recourse to drilling or jetting. Various hammers can be evaluated so that the desired sizes or types can be selected. The wave equation has also been used as an aid in the design and selection of pile makeup, extension lengths, type of pile chasers, pile cushions and other necessary pile driving accessories. Improper choice of such accessories can undermine an otherwise good pile driving operation. T.J. Hirsch and C.H. Samson, Jr. The purpose of this paper is to briefly describe the phenomena which can cause cracking and spalling of prestressed concrete piles during driving and to outline procedures which will prevent these problems. In some cases of driving of prestressed concrete piles, cracking and spalling have been encountered and in most instances these problems can be avoided by following certain rules of good driving practices. The recommendations presented here are based on sound physical principles and have been proved effective in practice. To review and summarise Smith’s original method of analysis and to derive a more general solution. To determine how the numerical solution is affected by the elasticity of the ram. To compare results given by the wave equation with those determined by laboratory experiments and field tests. To illustrate the significance of the parameters involved, including cushion stiffness and damping, ram velocity, material damping in the pile, soil damping and quake, and to determine the quantitative effect of these parameters where possible. To show how the wave equation can be used to determine the dynamic or impact characteristics of the materials involved. To determine the dynamic properties of the cushion subjected to impact loading. To study the effect of internal damping in the pile and its significance. T.J. Hirsch; H.M. Coyle; L.L. Lowery and C.H. Samson; Jr.
Instrumentation for use in piling is probably subjected to some of the most severe environmental conditions the average practicing engineer wi11 ever encounter. Impact stresses to 100,000 psi,accelerations of 1,000 g’s,and the need for absolute waterproofing to permit long-term measurements are but a few of the problems encountered. The consequences of this environment become obvious when the large sums of money needed to fund experimental piling programs are compared with the limited amount of data obtained. Nevertheless, then necessity to supplement, support, and verify our ever increasing methods of analysis with experimental data has caused rapid expansion in the use of instrumented piles. 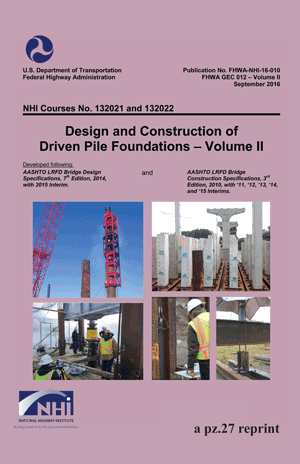 An investigation of driving large offshore piles at the point versus driving at the head of the pile is presented in this paper. The effects of varying cushion stiffness and of multiple hammer blows are also shown. Results indicate that no increased driving ability may be expected by changing the hammer position from the head to the point. This report should be considered as a supplement of Research Report Number 33-7 (below.) As stated in the preface, Research Report Number 33-7 was considered as an interim report of an exploratory investigation into the dynamic load-deformation properties of sands. This supplement (Research Report 33-7A) includes improvements in instrumentation which were made since the interim report was published, and it presents results of final tests on the dynamic properties of three different sands. Peak dynamic and static strengths of saturated sand samples under triaxial confinement are determined experimentally and presented herein. Particular attention is given to the effects of loading velocity, sample density. and intergranular pressure. Experimental results are compared with results predicted by using the rheological model currently in use with the computer solution of the wave equation. A modification of this rheological model is proposed so that it can be used to reproduce experimental data and correctly predict peak dynamic load. Foundation piles of many kinds have been used for centuries and the driving and design of a satisfactory pile foundation is often dependent upon experience and judgement. For well over 100 years, engineers have attempted to derive dynamic pile driving formulas which would serve to establish the static bearing capacity of piles. However, many engineers today realize that the numerous dynamic pile driving formulas which have been used, and are still being used, have serious limitations and cannot be depended upon to give reliable results. But they are still used for lack of an adequate substitute. The possibility of relating the behaviour of a pile during driving to its static load carrying capacity by the use of the wave equation method of pile driving analysis is encouraging. This method is based on the theory of longitudinal stress wave transmission that is covered in a general by the wave equation. Furthermore, it also considers influencing factors such as the use of cap blocks,) pile caps, cushion blocks, composite piles, as well as shear characteristics of soils under dynamic loading. As a result, the wave equation method is not just another dynamic pile driving formula, but rather, it is an analytical method which is well founded. A systematic investigation of applying the wave equation concept on pile driving has been performed by the staff of the Structural Research Department of the Texas Transportation Institute. The papers published thus far on this subject matter may be divided into two main phases. The first is concerned with programming of the computer solution of the wave equation and theoretical stress analysis. The second phase is concerned with field measurement and experimental investigations. This study is part of the second phase. The pile penetrations required to support the design loads for offshore structures are usually obtained from ultimate pile capacity curves developed by computations based on soil conditions as determined by a geotechnical investigation. When this procedure indicates large piles are to be installed to substantial penetrations or the soil conditions are such that the piles will have to penetrate dense sand layers or other strong soils, a question can arise whether the piles can be installed to the required penetration by driving only. 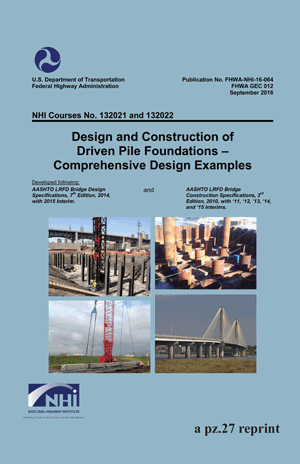 Information to assist answering this question may be developed by a pile drivability analysis. Carl Fenske of McClelland Engineers (now Fugro) was one of the great geotechnical engineers in the early years of offshore oil development. L.L. Lowery, Jr., T.J. Hirsch, T.C. Edwards, H. M. Coyle, and C.H. Samson, Jr. 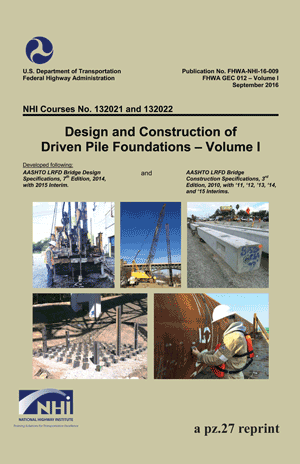 The broad objective of this report was to fully develop the computer solution of the wave equation and its use for pile driving analysis, to determine values for the significant parameters involved to enable engineers to predict driving stresses in piling during driving, and to estimate the static soil resistance to penetration on piling at the time of driving from driving resistance records. With this study, wave equation analysis of pile driving became a practical reality. Virtually all of the basic issues relating to the basics of wave mechanics in piles and their application were analysed in this study. It is also the most complete single reference on the history and details of the TTI wave equation program. This report concerns itself with an instrumented field test pile used to investigate the failure mechanisms which are developed in clay soils subjected to pile driving and foundation loadings. The ultimate load response of the pile-soil system was evaluated for both dynamic and static loadings. A test pile instrumented with pressure transducers, strain gauges, and accelerometers was driven into a saturated clay at a site in Beaumont, Texas. Measurements of strains and acceleration of the pile were taken during driving. Pore pressure measurements were made at the pile-soil interface for a continuous period of 30 days after driving. Strain measurements were made during static load tests at 13 days and 30 days after driving. Soil borings were made for the in-situ, remoulded, and reconsolidated conditions and at specific radial distances from the pile. Conventional tests were conducted on the soil samples to measure the changes in engineering properties for the different conditions. The most important single result of this study has been the determination of the mode of failure developed when a steel pile is driven and loaded in a cohesive soil. Both static and dynamic load responses for the pile-soil system considered in this study are a function predominately of the soil properties within the region of local shear failure. The region of local shear failure is in turn a function of the pile diameter. In the course of a laboratory investigation of longitudinal strain waves in 5000 psi concrete piles, the question of pre-cracked piles arose. The investigators were concerned that the piles to be used in this investigation had been subjected to dynamic overload due to the method used in transporting the piles from the casting yard to the laboratory. The piles were transported approximately 150 miles by truck (tractor and pole trailer). It was noted upon receipt of the piles that the distance I between supports was greater than that recommended by the Bridge Division of the Texas Highway Department. It was decided, therefore, that a very limited test program would be conducted to get some qualitative and quantitative data on the behaviour of piles under certain controlled hauling conditions. Field data on pile strains or stresses were also desired in order to establish the feasibility of developing a mathematical model to predict the stresses generated during hauling. It is the object of this report to give the results of this limited test program and explore the feasibility of using a mathematical simulation to predict dynamic stress levels induced by hauling.